A chopper tricycle is designed with a cool laid-back chopper look. You can add a little pizzaz to your trike and turn heads while you ride. And, still have all of the benefits that a trike offers like... No balance issues due to a stable platform. You also have a lower step over than a bicycle for easier mount and dismount. 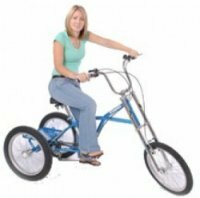 The pedals on the chopper tricycle are positioned forward of the seat post which enables the rider to place both feet flat on the ground while seated. So if you want to take a breather, or stop and chat with a neighbor, you can do it in complete comfort.The rear wheels are on 27 inch centers for a firm stable platform. The triple forks are unique to choppers. The swept back handlebars give a comfortable riding position. The rear platform will accommodate a basket for convenience. You have enhanced stopping power with rear drum and front V brakes. There are 6 speeds available to maximize pedaling efficiency. Looking for other tricycle styles? Go here.